A Taste of the Riverwalk Tour by Gourmet Trek!!! Hello all, Jerm back here on this rare overcast Friday with some news about a pretty sweet event that is coming up here in the next few weeks! Our friends over at Gourmet Trek Tours are at it again with yet another cool idea! By now I am sure many of you have heard about our exciting Riverwalk Project here in downtown. I won&apos;t go into great detail about it, but once finished its going to be amazing! See the link if you want additional info though! Just to give you a taste of whats coming, our friends over at Gourmet Trek will be putting on a new tour that allows you to Enjoy the taste of the Riverwalk by Boat! Sample the Riverwalk flavors from five to six Restaurants along the Tour. Also learn the history of the Riverwalk along with all the new exciting developments planned for the future. Now you must be 21 years of age to attend, and the cost $55.00, so get your tickets now! As far as great Tampa Bay area events goes, it won&apos;t get much better than this folks! 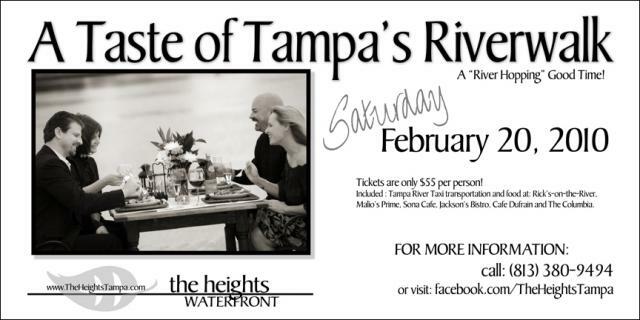 Some of the great Tampa Bay dining spots all in one night, so start buying your tickets now!